BGF would like to share the article by STEVEN GREENHOUSE about the aid set for Bangladesh Garment Workers since the collapse of the Rana Plaza factory. The original can be found the New York Times website. Eight months after the Rana Plaza factory building collapsed in Bangladesh, killing more than 1,100 workers and leaving hundreds of families bereft and financially adrift, several prominent retailers and labor groups have joined with the Bangladesh government to create an estimated $40 million compensation fund to aid the victims’ families. So far, four retailers — Bonmarché, El Corte Inglés, Loblaw and Primark — have pledged to contribute to the fund, which is intended to compensate the families of those who died last April 24 in what was the deadliest disaster in garment industry history. The new fund is considered a landmark in compensating families of garment industry victims, in terms of both the amount to be paid and the sophistication of the arrangements. No United States-based retailers have signed on. Several officials involved in negotiations to establish the fund said in interviews that the families of the dead would receive, on average, more than $25,000 each, while hundreds of workers who were injured or maimed would also receive compensation. Per capita income in Bangladesh is about $1,900 a year. Families of the victims have already received several months of short-term emergency aid from the Bangladesh government as well as from Primark, an Anglo-Irish retailer. But these families have been pressing for long-term compensation. In some families, with the mother dead, children have quit school and gone to work. In other cases, workers who were seriously injured and cannot work are desperate for income. Talks to establish the fund, coordinated by the International Labor Organization, began in September but stalled over such issues as how to collect information on claims, how to determine which claims were legitimate and who should administer the fund. The amount to be paid will be based on the anticipated wage loss of each worker killed, tied to the number of children, or, if the beneficiary is a parent, to the life expectancy of an adult. Among the groups that signed the agreement to create the compensation were the Bangladesh Garment Manufacturers and Exporters Association, IndustriAll Global Union, the Bangladesh Employers Federation and the main Bangladesh coalition of labor unions. Some retailers and labor rights groups have expressed dismay that no United States retailers have agreed to join the compensation effort. Loblaw owns the Joe Fresh apparel chain, with apparel from one of Rana Plaza’s factories. Amid warnings that its columns were crumbling, the poorly constructed building collapsed, crushing hundreds of workers in tons of concrete and steel. Labor rights groups say they found documents and remnants of apparel tying 25 European and American retailers and brands to the five garment factories spread across Rana Plaza’s eight floors. Several of the firms have since denied their apparel came from any of the factories. Mango, a Spanish apparel brand, said, for instance, that it only had a test order in a factory there. 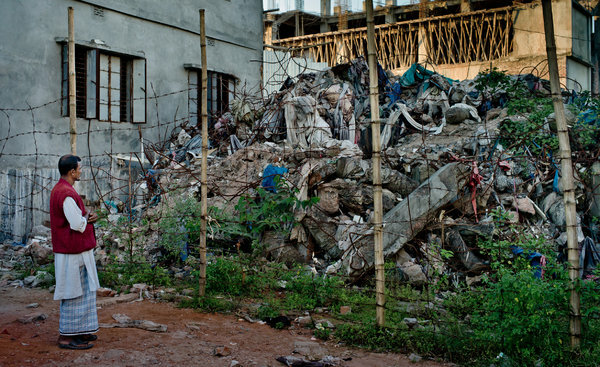 Walmart has been urged to help the Rana Plaza families because production documents found in the rubble indicated that a Canadian contractor was producing jeans for Walmart in 2012 at the Ether Tex factory inside the building. Walmart said an unauthorized contractor was producing garments there without its knowledge. It says it is focused on assuring that there are no such disasters in the future. The Children’s Place, which had obtained apparel from one of the factories inside Rana Plaza, said the factory was not supplying it at the time of the collapse. A Walmart official said the company had no comment about requests for it to contribute to the fund. The Children’s Place did not respond to inquiries. Officials involved in the compensation fund say they have not yet worked out how much money each participant should contribute. That will depend, in part, on how many retailers ultimately agree to participate and whether various governments agree to give money. Some industry experts say the American companies are afraid to participate for fear of being exposed to legal liability or appearing hypocritical after denying that they knowingly did business at Rana Plaza at the time of the collapse.